What Is Up with Rabbittude? Sometimes in life, you just have to stop talking about things and just work through them. It has been a bit of a rough patch here since last fall. There were some significant changes in some of the services we use and a really bad fall allergy season was followed by one of the worst winters we’ve had here in a long time. It all became a bit too much juggling. I decided to just keep focused on working through it all and bring the blog back when we were on a more even path again. Today is a really good day to start talking again. 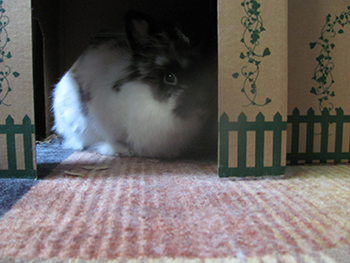 As of today, we have officially had little Leo the Lionhead with us for two years. I will sometimes call him Le Li for short, pronouncing that as “lee lee”. I would have to say that Leo is the shyest bunny rabbit I have ever known. He holds back a lot. It has made getting to know him a real challenge. I decided this afternoon to try to get a good close up picture of him now. LOL, camera-shy he is not. 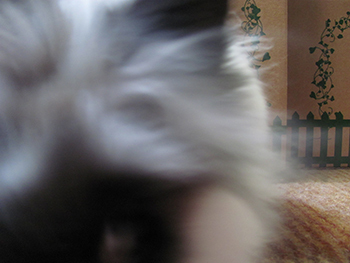 Every time I put the camera on the floor, he had to make sure the close up was really up close and personal. 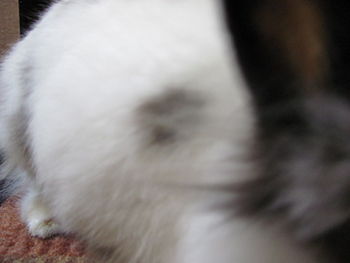 In trying to get a good shot, he nosed the lens, chewed the small tripod I had the camera on and I think probably got a whole bunch of bunny fur, dander and just general essence of bunny rabbit all over the camera. As you can see, first attempts were way too up close and personal. I finally had success with the third shot by literally putting the camera right down and clicking the button as soon as the tripod hit the floor. If there had been a fourth shot, it would have looked like the first two all over again. So maybe I need to get the camera out more often if I want Leo to come straight to me … Rabbits are all such different personalities. Each new rabbit we come to know is very unique and different from every other rabbit we have known.